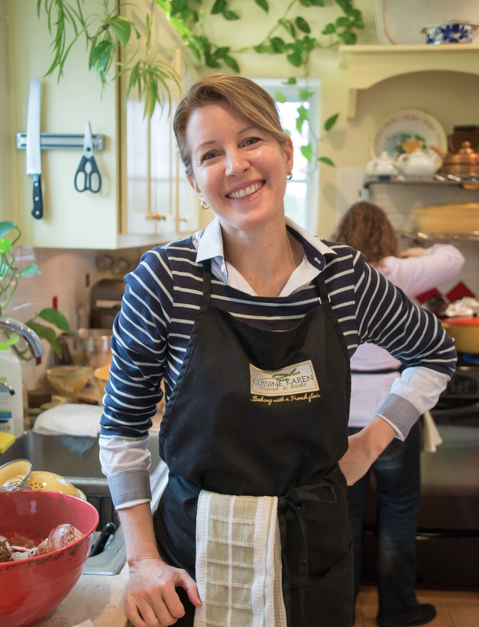 Chef & Culinary Instructor Karen Gros, owner of Cuisine Karen, provides French-inspired cooking classes in her Provençal-style home in Eureka Springs, Arkansas. Classes emphasize seasonal health-conscious menus, including traditional (subtly adapted) French classics, prepared with locally grown and raised ingredients ~ high-integrity homemade recipes from “scratch” with top quality, healthful ingredients. Chef Karen also offers private cooking parties and company team building cooking events, and is available as a personal chef for your private dinner party in your home or hers. She is passionate about passing on her knowledge of classic French cuisine and healthy recipes, including cooking with fresh and dried herbs, spices, and the making of stocks and sauces. A newly declared French citizen, Karen shares her love of France by taking small groups on “insider” tours to Paris, Provence, Normandy & Brittany. By request, Karen has recently added Greece to the line up. She organizes the tours from A to Z, emphasizing food, of course, but also history and cultural traditions. Experiencing the locals first-hand is a unique feature of the trips. As an expert travel planner, fluent in French, and knowledgeable in French culture & protocol, Karen guarantees a unique & personal travel experience, a hassle-free trip of a lifetime. Having been married with a man from Marseille for 22 years, Karen has spent much time in French kitchens and has had the luxury of being taught first-hand by her French in-laws. She attributes her success in the kitchen to their discriminating tastes, which have aided in developing her refined palate. Culinary education includes master classes at the Lenôtre Ecole de Cuisine and the Francoise Meunier Cours de Cuisine, both in Paris; Eggstravaganza workshop at Dairy Hollow in Eureka Springs with baker Jen McAllister, winner of American Egg Board Fellowship; culinary courses at the University of California at Los Angeles and Santa Monica College. Karen holds a bachelor degree in Business Administration with an emphasis in marketing from Loyola Marymount University in Los Angeles, and has enjoyed serving as a judge at the Eureka Springs Chocolate Festival for two consecutive years. Karen is thankful to her good friend Jennifer, COO with a top pastry chef in Paris, for bestowing upon her a wealth of culinary knowledge and appreciation, as well as the inspiration to teach culinary classes. Karen lives the majority of the year in Arkansas; she has two children, Manon age 21, and Marcello 20, who have left the nest to begin their journey in the world. Visit In the Media for press coverage.